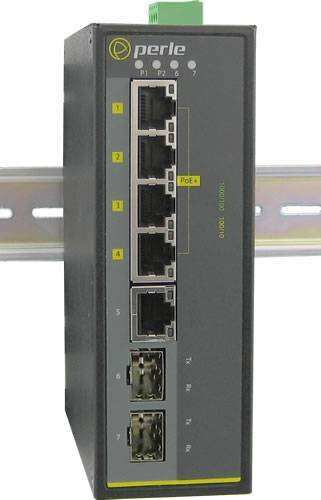 IDS-105GPP-DSFP - Industrial Ethernet Switch with Power Over Ethernet- 5 x 10/100/1000Base-T RJ-45 ports, 4 of which are PoE/PoE+ capable and 2 x 1000BASE-X SFP slot ( empty ). 0 to 60C operating temperature. IDS-105GPP-DSFP Industrial PoE Switch. 5 x 10/100/1000Base-T Base-T RJ-45 ports, 4 of which are PoE/PoE+ capable and 2 x 1000BASE-X SFP slot ( empty ). 0 to 60C operating temperature. The IDS-105GPP is designed to stand up to extreme temperatures, surges, vibrations, and shocks found in industrial automation, government, military, oil and gas, mining and outdoor applications. This 7 port Compact DIN Rail Switch provides advanced performance and enables real-time deterministic network operation. It requires no configuration and will instantly operate as soon as you power it up. In addition, these PoE Switches are classified as Power Sourcing Equipment (PSE). While using standard UTP cables that carry Ethernet data, the IDS-105GPP have 4 ports that also provide up to 30 watts of power to Powered Devices (PDs) such as wireless access points, Voice over IP phones and IP cameras. For complete product details and technical specifications, please visit our IDS-105GPP 5 port Industrial Gigabit Power Over Ethernet Switch Product Page.